Arabic media says Israel asked for European mediation to return bodies of Hadar Goldin and Oron Shaul from Hamas. Israel requested that European sources intervene with Hamas to negotiate the return of the bodies of IDF soldiers killed in Operation Protective Edge last summer, according to an Arabic paper in London on Monday. 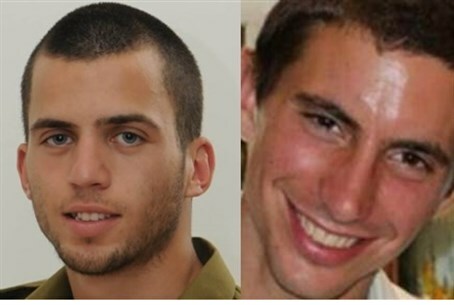 Last October there was talk in Hamas of a swap of Arab terrorists in exchange for the bodies of Givati Brigade officer Hadar Goldin and Golani Brigade combat soldier Oron Shaul, although the deal never materialized. According to the report in Al-Araby Al-Jadeed as cited by Israel Radio, which currently does not have confirmation from another source, Israeli security sources contacted sources in Germany and elsewhere in Europe a month ago asking for them to help return the fallen soldiers. Hamas reportedly responded and clarified it will not discuss the return of fallen IDF soldiers until Israel releases the 63 Arab terrorists freed in the 2011 Gilad Shalit deal who were since rearrested for returning to terrorism. A total of 1,027 terrorists were released in the deal. Around a month after the operation ended last August, Hamas official Mushir al-Masri hinted at the terrorist organization having possession of the bodies and at the possibility of a deal. "Hamas has a bargaining chip, by forcing Israel to accept Palestinian demands," he said at the time. "Ongoing indirect negotiations, brokered by Egypt, may lead to a new deal for prisoner releases. We will release as many Palestinian prisoners as possible." Among the many terrorists released in the Shalit deal who immediately returned to violent terrorism was Ziyad Awad, who murdered police Chief Superintendent Col. Baruch Mizrahi last April while aided by his 18-year-old son Az a-Din.